Saudi Vision 2030 promotes the development of downstream business in plastics, chemicals, and other related industries related to oil and gas production. An example of efforts to diversify Saudi industry and make a push in downstream businesses is the Sadara Chemical Company in Jubail. The joint venture between Saudi Aramco and The Dow Chemical Co. produces a broad slate of high performance plastics and specialty chemicals — many of which are new to the Kingdom and the region. Dhahran — This year, the Kingdom of Saudi Arabia celebrates its 88th National Day. Over the course of almost nine decades, the Kingdom has experienced incredible developments in its economy, which has evolved dramatically — from one based largely on traditional local caravan trade commerce to one with both national and international reach. Saudi Arabia now has the largest economy of any Arab country and the 20th largest in the world. Much of this strength is due to the fact that the Kingdom is one of the world’s biggest oil exporters. But Saudi Arabia is ready to diversify its economy to be closely attuned to the global marketplace. This drive toward the future is guided by the Kingdom’s Vision 2030. As we mark Saudi Arabia’s National Day next Sunday, this is an opportune time to take a look at the nationwide economic transformation that has been underway since the launch of the Kingdom’s Vision 2030 in April 2016. At Ras al-Khair, The King Salman International Complex for Maritime Industries and Services will transform the face of rig and shipbuilding — both regionally and globally. The complex will offer a broad palette of development for the Kingdom — opening the doors for strategic industries to operate and flourish. Vision 2030 is a national strategy designed to reform and diversify the economy, foster increased investment from all sources, create meaningful employment for Saudi Arabia’s burgeoning, young population, and on many levels, open up the Kingdom to the world. With the blessings, guidance and active support of the Custodian of The Two Holy Mosques King Salman ibn ‘Abd Al-‘Aziz Al Sa‘ud, the strategy is being implemented under the direction of HRH Prince Mohammed ibn Salman ibn ‘Abd Al-‘Aziz Al Sa‘ud. Guided by this platform, Saudi Arabia’s governmental bureaucracy and regulatory system are being dramatically reformed and streamlined to create investment opportunities that will help the Kingdom move away from its traditional dependence on the petroleum sector, and in the process, create new business opportunities and meaningful jobs nationwide. There is widespread public support for this strategy and the exciting future it portends, filled with promise and possibilities. How does Saudi Vision 2030 work, and how far has the Kingdom advanced since it was announced more than two years ago? Can we see tangible signs of progress? And what prospects lie ahead for the people of Saudi Arabia? To the average person, the most visible signs of Vision 2030 may be social and cultural: for example, licensing women to drive and reintroducing cinemas across the country. But important economic changes are afoot as well, and they have begun to have an impact, and will become more visible as time goes on. The company has long considered its social responsibilities paramount to doing business in the Kingdom. 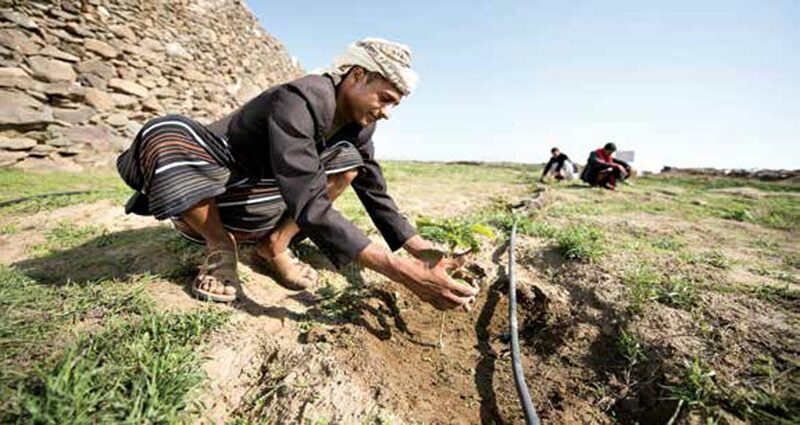 Recent efforts have included helping farmers in Jazan irrigating and marketing their coffee bean crop. driver education and driving licenses to women. Setting forth the details of Vision 2030, Crown Prince Mohammed stressed the importance of the Kingdom’s population in making this vision a reality. About 60% of Saudi Arabia’s citizens are under the age of 30, and about 70% of Saudis are internet savvy, according to best estimates. These numbers clearly indicate the Kingdom is well positioned for change. A vibrant society lives by the Islamic principle of moderation, is proud of its national identity and its cultural heritage, and enjoys a good life in a “beautiful environment” enhanced by effective social welfare and health policies. A thriving economy is built upon an educational system “aligned with market needs,” and it creates economic opportunities for entrepreneurs, small businesses, and large corporations. Initially, more than a dozen programs were announced to reform government agencies and regulations with the goal of encouraging foreign and domestic investment and diversifying the business environment. Among other areas, these programs have focused on government restructuring, strategic directions, fiscal balance, project management, regulations review, performance measurement, human capital, strategic partnerships, privatization of public entities, and governance of the public sector. Perhaps the best known program is the National Transformation Program, which is designed to transform government agencies and other state institutions into flexible, transparent mechanisms that facilitate the changes sought under Vision 2030. After four consecutive quarters of economic recession in 2017 — the first such slowdown since 2009 — the Saudi government announced recently that the national economy had turned the corner in 2018, and showed impressive strength in the first quarter of this year. The recovery was attributed not only to the increase in crude oil prices, but also to growth in the non-oil sector, according to the General Authority for Statistics. The structural reforms mentioned were, of course, the early steps in implementing Vision 2030. Making dramatic changes in the structure of state agencies is bound to cause hesitation in the marketplace, as businesses hold off on new purchases and projects and look to see where the economy is going. By late 2017, the business sector showed growing confidence that the changes were working, and the Gross Domestic Product (GDP) began to improve. The Saudi economy registered annual real GDP growth of 1.2% in the first quarter of 2018, year-on-year, according to the statistics authority. It reported accelerated growth in both the oil and non-oil sectors. The oil sector grew by 0.6% in the first quarter compared to a 4.3% drop in the same quarter in 2017. For its part, the nonoil sector grew by 1.6% in the first quarter of 2018 compared with 1.3% growth for the first quarter of 2017, year-on-year. The General Authority for Statistics said the main drivers behind the recovery were growth in the non-oil manufacturing sector and in the mining sector — by 4.6% and 6.3%, respectively. Given the commitment to Vision 2030, these sectors are expected to lead the Kingdom’s future economic growth. Overall, nearly 47% of the growth in the GDP in the first quarter was attributed to the private sector. The oil sector accounted for more than 30%, and the government sector for more than 22%. Bloomberg News, citing the Saudi Arabian Monetary Agency (central bank) data, reported that bank loans to private businesses in Saudi Arabia grew in April for the first time in more than a year. Withdrawals from automated teller machines — a measure of household spending — also showed signs of recovery. Saudi financial authorities were quoted as saying they expect non-oil GDP to expand 3.7% this year. Vision 2030 has been promoting the development of downstream businesses in plastics, chemicals and related industries to add value to oil and gas production and, at the same time, to diversify Saudi industry. An example of this downstream push is Jubail’s Sadara Chemical Company — a Saudi Aramco-Dow Chemical joint venture, launched in 2011 that began full, on-spec commercial operations in September 2017. Sadara produces a broad slate of high performance plastics and specialty chemicals, including polyurethane precursors — many of which are new to the Kingdom and the region. 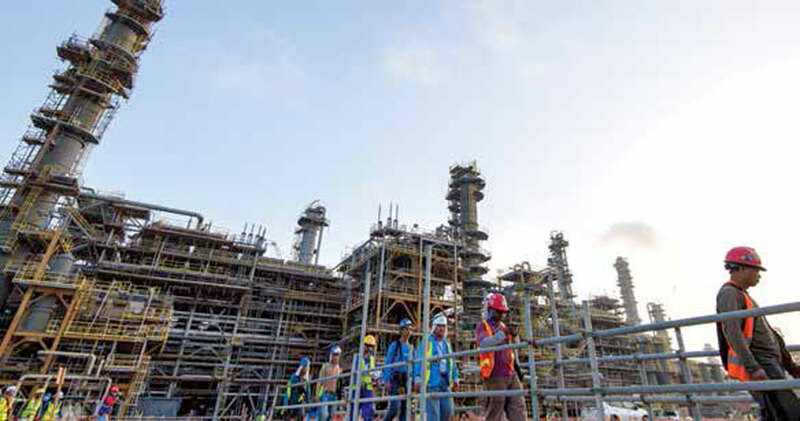 In collaboration with the Royal Commission for Jubail and Yanbu’, Sadara is developing PlasChem Park, a 12 km2 industrial zone next-door to its 6 km2 chemical complex and a base for new manufacturing companies supporting the country’s economic transformation. The park, with infrastructure provided and feedstock available from Sadara and others, encourages investment from both domestic and international companies. 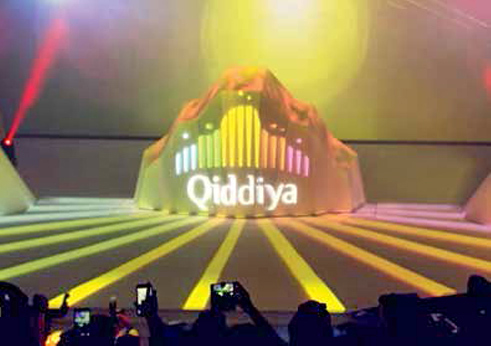 As tourism becomes a primary focus in Saudi Vision 2030, the creation of new ventures such as Qiddiya Entertainment City have become crucial to the development of a robust social and cultural scene in the Kingdom. Creating a vigorous and diversified nonoil economy involves projects in numerous sectors. The 2018 budget focuses on nonoil expansion, with larger capital allocations for sectors such as transportation, construction and utilities, according to this year’s Saudi economic outlook by Aljazira Capital. “The economy is also marching toward privatization,” the bank’s report said, as the government announced several reforms to attract private players, including a SR 72 billion stimulus focused on housing, exports and manufacturing. 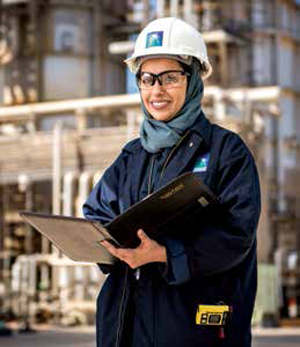 Building a diverse, non-oil economy will create many meaningful jobs, and this means new opportunities not only for Saudi men but also for Saudi women. In recent decades, many Saudi women have been pursuing educational opportunities, securing college degrees and certification in various forms of advanced training. Vision 2030 recognizes the value that women can add to the new economy, and it plans to increase their participation in the workforce from 22% to 30% by the year 2030. To facilitate female involvement in the expanding workforce, the government this year opened up driver education and driving licenses to women. 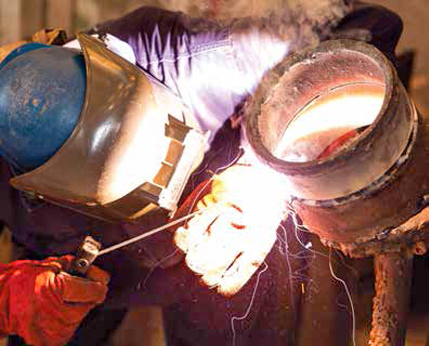 workforce from 22% to 30% by the year 2030. Vision 2030 also seeks to develop the tourism sector and inject new vitality into the Kingdom’s underdeveloped entertainment industry. To these ends, the Kingdomis developing two “giga-projects” — Qiddiya Entertainment City and The Red Sea resort complex. Qiddiya, scheduled for completion by 2030, will be a vast complex some 40 kilometers west of Riyadh, encompassing entertainment, sports and cultural attractions. At 334 km2, it will be three times the size of Florida’s Disney World. Once completed, the city is expected to attract 17 million visitors annually to the entertainment complex, 12 million to shopping areas, and 2 million to the hospitality sector. When its first phase opens in 2022, Qiddiya is projected to attract 1.5 million visitors its first year, a spokesman said. Also by 2022, the city will provide jobs for some 55,000 people. Included in the planning for Qiddiya are theme parks (among them, Six Flags); entertainment centers; sports facilities for hosting international competitions; motorsport tracks; water- and snow-based attractions; nature and safari experiences; and much more. Last April, King Salman and Crown Prince Mohammed attended the groundbreaking ceremony for the start of construction at Qiddiya. At that time, Qiddiya’s CEO Michael Reininger told Reuters that the project was seeking a broad range of financing from local and international sources. Bonds, direct investment, and other financing would supplement the majority contribution from the Public Investment Fund, he added. The fund is also the main financier of a second tourism giga-project, called The Red Sea resort. This project envisions a coastal island resort, located between the Red Sea towns of Umlaj and Al-Wajh, close to one of the Kingdom’s most diverse nature reserves as well as to the ancient ruins of Madain Saleh, and in the shadow of the dormant volcanoes of Harrat al-Rahat. The resort complex will be developed in partnership with some of the world’s leading hospitality firms. The Red Sea resort will serve as a wellness center, local press reports said, and will also set “new standards for sustainable development and environmental protection,” given its location in an ecologically delicate zone. To ensure the protection of the area’s wildlife, vegetation, marine life, and coral reefs, the number of visitors each year will be capped. In addition, local heritage sites will be restored. The Red Sea resort project aims to generate SR 15 billion each year for the Saudi economy and create 35,000 jobs, according to the newspaper Arab News. Initial groundbreaking is expected to take place in the third quarter of 2019. The first phase of the project — including development of hotels, luxury residential units and logistical infrastructure such as air, land and sea transportation hubs — should be completed by the fourth quarter of 2022. 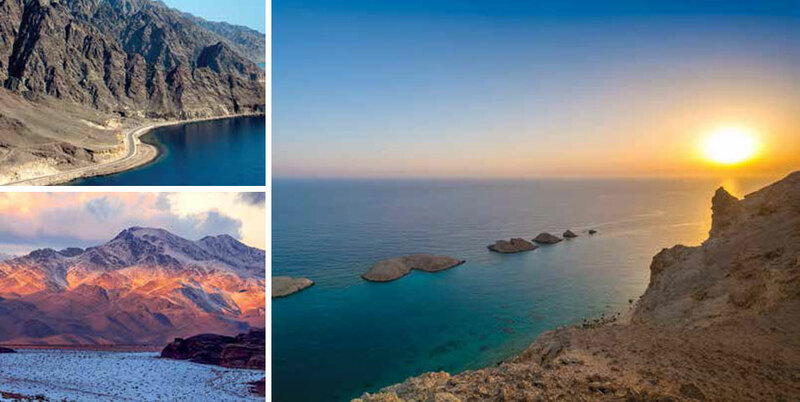 The ambitious NEOM project symbolizes just about all aspects of Vision 2030. The $500 billion futuristic economic and industrial metropolis will be built where Saudi Arabia, Egypt, and Jordan meet, and it has already attracted direct investment interests from a variety of international sources. The fund is a major contributor to another giga-project — the futuristic, transnational mega-city of NEOM, which is a $500 billion economic and industrial metropolis to be built where Saudi Arabia, Egypt, and Jordan meet. “NEOM” is short for an improvised Latin-Arabic term: Neo-Mustaqbal, meaning New Future. The 26,500 km2 business zone, to be developed in the Tabuk area of northwest Saudi Arabia and extending into Egypt’s Sinai Peninsula and into Jordan, is already attracting foreign direct investment interest from a wide range of international sources. The ambitious project symbolizes just about all aspects of Vision 2030. It will feature the most advanced digital technology, will serve as a proving ground for innovation and sustainability, and will focus on such future focused fields as energy and water, biotechnology, food, advanced manufacturing, and tourism. The project is expected to take between 30 and 50 years to complete with its first phase due by 2025. Construction has already begun on hotels and other facilities. King Salman showed his personal support for the NEOM project by visiting the site in July. An exciting future lies ahead for Saudi Arabia, filled with increased prosperity and opportunity. The wheels are fully in motion to make Vision 2030 a reality — there has never been a more exciting time to be a part of the Kingdom.